A neuroma is one of the most common causes of forefoot pain (ball of foot pain). Basically, a neuroma is inflammation or thickening of nerve tissue. 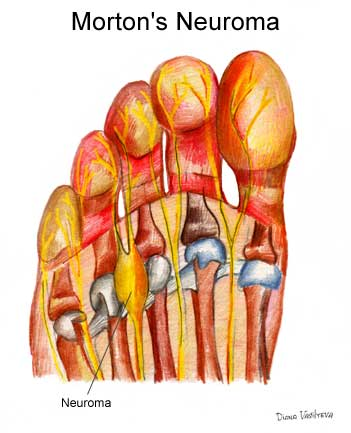 The most common neuroma of the foot is a Mortons’ neuroma, which occurs between the base of the 3rd and 4th toes. Symptoms may include a sharp pain or burning across the affected area, and sometimes numbness is noted in the toes. Anything that causes compression or irritation of a nerve can lead to a neuroma. The most common offender is wearing shoes with a tapered toe box, especially high heeled shoes (which is why a neuroma occurs more frequently in women). People with bunions, flat feet and a flexible foot type are also at a higher risk of developing a neuroma. What Can I Do To Help Treat a Neuroma? Wear wide toe box shoes and avoid high heels. Don’t lace the forefoot part of the shoe too tight. Place ice pack on painful area for 10 minutes/3 times a day. Avoid activities that place repetitive pressure on the neuroma. If this fails to help your symptoms, then you should consult your local Podiatrist for specific metatarsal padding and/or orthotics. Anti-inflammatory tablets and cortisone injections may also help, and as a last resort, surgical removal of the neuroma.